Aliens were involved when Moses led his people through the desert. Aliens were involved when Emperor Constantine adopted Christianity as official religion of the Roman Empire. And aliens were involved when Muhammad received the Quran. In fact, alien beings have been visiting and influencing the earth since before the time of humans. Initially, they interacted with us openly, and were often worshiped as gods by the local people. At some point around the time of Moses, the aliens went underground. Past references to aliens were hidden or destroyed. Future references to aliens would now conflate them with spirit beings, and describe them as visitors from the heavens. Because of this blackout and deliberate obfuscation, there’s a lot we don’t know. We do know that there are numerous species visiting us, and they don’t always see eye to eye. We see this in the Bible’s reference to the battle between archangels Michael and Lucifer. We see this in the fight between the flying Vimanas in the ancient Indian Vedas. 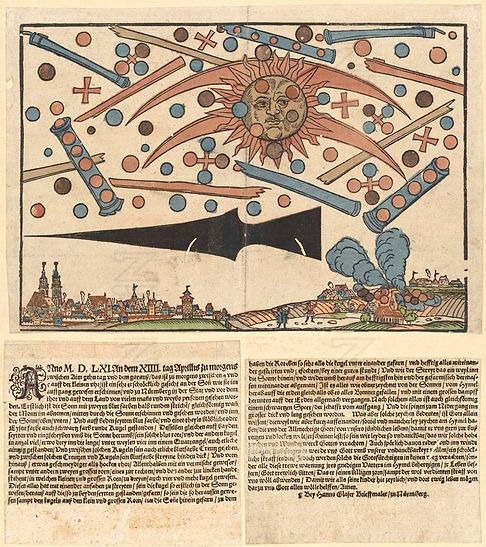 And we see this in more modern times, as published in Nuremberg Germany in 1561. This should not be a surprise. Once we leave the perfection of the one God in the spirit world, we enter the duality in the physical one. Instead of oneness and unity, we have hot and cold, light and dark, and good and evil. This is true for aliens too, whether they be a god, angel, or devil. Many people were shocked to learn that there exists in our country a “deep state,” something that keeps working no matter who appears to be steering the ship. In reality, our world is controlled through many legacy systems that include religion, government, money, and the press. And behind those facades, are the control of secret societies and royal bloodlines. And behind all of those edifices, lie our alien overlords (both good and evil), still exerting influence over the affairs of humans here on earth.